National Farmers Market Week, proclaimed by the U.S. Department of Agriculture, begins Sunday (Aug. 7) and runs through the following Saturday (Aug. 13). We at FamilyFarmed are all about encouraging our readers to become farmers market customers — if they are not already — and enjoy the super-healthy, nutritious and delicious products sold by their local and regional growers. 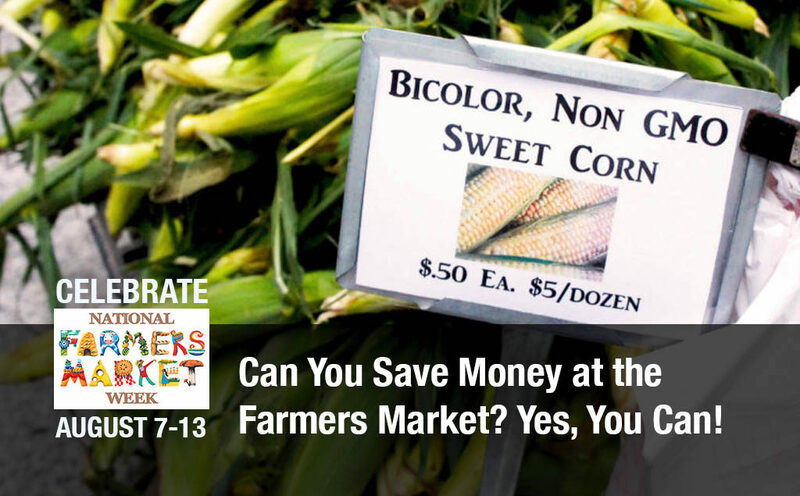 That is why we have an annual tradition of welcoming Farmers Market Week with an article full of tips about how to save money at farmers markets. This sector has expanded greatly in recent years. 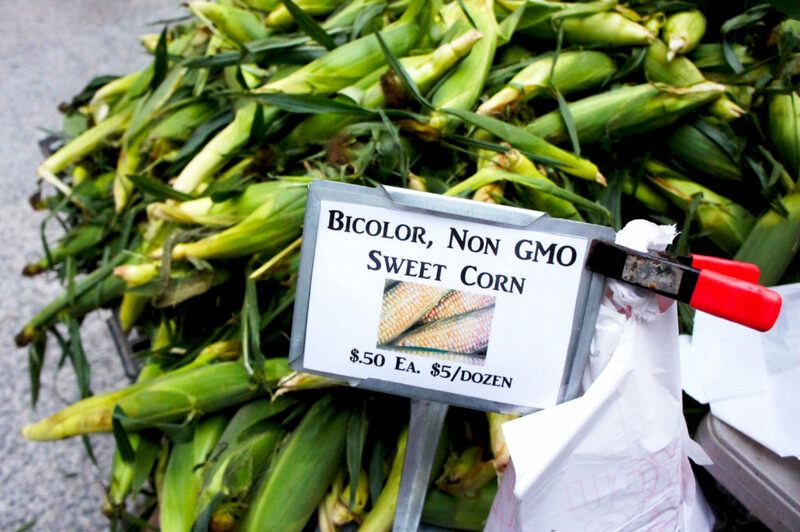 The current listing on the USDA’s “Know Your Farmer, Know Your Food” webpage counts 8,676 farmers markets across the nation, about 3-1/2 times as many as 20 years ago and nearly twice as many as 10 years ago. 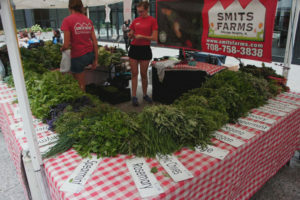 Smits Farm — which sells at several Chicago farmers markets, including this one at Federal Plaza — is a price leader. Those big bunches of herbs and greens go for between $1 and $2 apiece. Photo by Bob Benenson/FamilyFarmed. Yet these markets still face an obstacle, in the perception held by some people that they are too expensive. 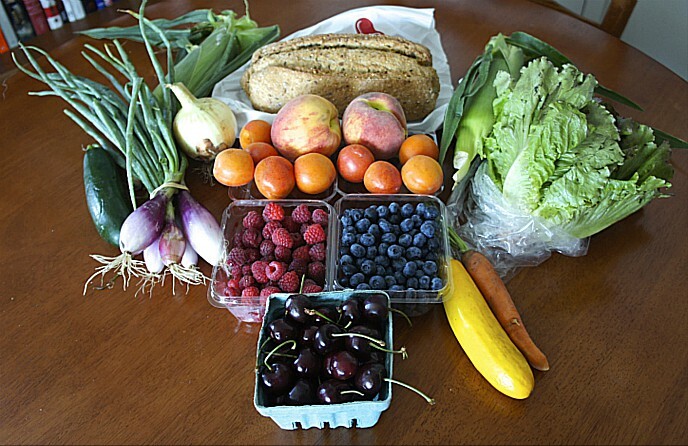 As a nearly compulsive farmers market shopper as well as a Good Food advocate, I will vouch that buying from your local farmers is always a great value — when you factor in the quality, freshness and heightened nutritional value of food picked within a day or two of purchase, at the height of its readiness. But savvy shopping can also make it very affordable for most people, and never more so than at this time of year, when the bounty of the growing season is overflowing the market bins and bringing down prices. That does not mean that the prices for some items are not going to be higher than at your local big-box supermarket. Produce grown organically or by other sustainable means is more labor-intensive than most conventional fruits and vegetables. Most vendors at farmers markets are small to medium-sized producers, so there aren’t the economies of scale that produce rock-bottom discounts at big-box grocery stores. And prices can be high for individual items that are not at the peak of their growing seasons (if they are available at all). Nonetheless, the growing conditions this year have been especially kind to farmers in our Chicago region, and I have been filling up my reusable bags with as much produce as I can carry. Here are some ideas about how you can do the same without busting your budget. • Stroll around the grounds. Make your farmers market visit an outing. Don’t rush… instead, walk around to see what is available, see if particular vendors’ products look especially tasty and, most importantly money-wise, who appears to have the best deals. Keep your eyes wide open, because there often is a stand (possibly more than one) that acts as a price leader, generally maintaining prices that are below average for the market. 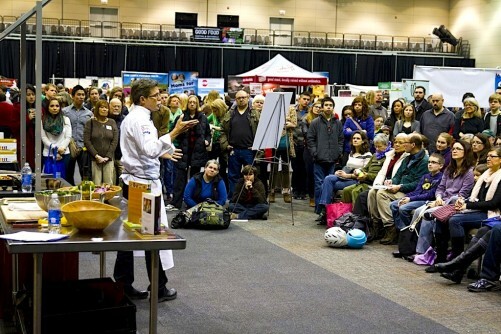 Since many farmers markets have kind of a festival atmosphere with side attractions such as live music, children’s activities and cooking demonstrations, you can make it part of a fun day out. 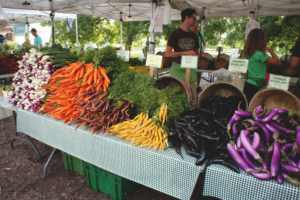 The color palette of a farmers market in season, such as the summer fruit from Michigan’s Mick Klug Farm (above) and the vegetables from Indiana’s Green Acres Farm (right), make Chicago’s Green City Market a feast for the eyes as well as the belly. • It’s the time of the season. We just can’t emphasize this enough. Vegetables and fruits are (obviously) most prolifically available at the height of their growing seasons. Simple supply and demand: The more of a product a vendor has to sell, the more likely it is that it is going to be priced to move. Great big summer squash and delicious sweet corn have been going for 50 cents a piece or less from some of our local vendors this season. Whereas no amount of money is going to buy you a peach in May (at least around here). So practice seasonality, and pocket savings. • Buy, buy, buy. 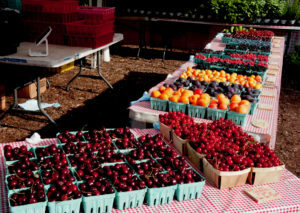 Many farmers market vendors provide discounts for multiple purchases of the same or similar items. So, for instance, if an item is priced at $1 per piece but $2 for 3, it is the equivalent of “buy two, get one free.” Or you might find you can get a pint of fresh-picked peaches for $4 but a quart (twice as much) for $6. An epic example of saving money by buying big. 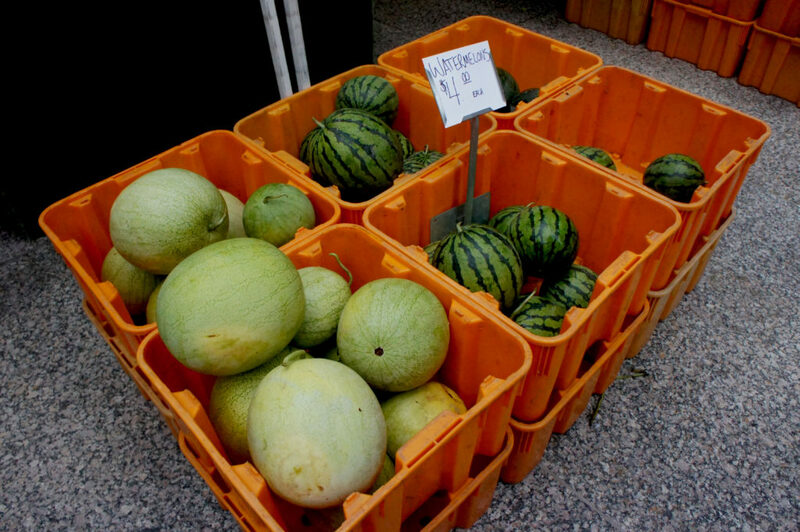 All of those watermelons from Nichols Farm and Orchard, on sale at Chicago’s Federal Plaza, are priced at $4. The small melons undoubtedly are excellent, but if you’re looking to get more for your money, those great big ones that are more than twice the size are the way to go. Photo by Bob Benenson/FamilyFarmed. • The shelf-life advantage.The fresher fruits and vegetables are, the longer they will keep at home. Much of the produce that is sold in supermarkets is grown hundreds or even thousands of miles away, so its shelf-life clock often has been running for a week, sometimes more, by the time you bring it home. Much of the produce you buy at a farmers market is picked within a day’s time, and can be picked at greater ripeness (and flavor) than products that have to travel far and thus are more susceptible to bruising and spoilage. • Have a few seconds? Here is an opportunity for you to save big bucks while doing something really good for society. Research has found that between a third and two-fifths of the food produced in the United States goes to waste. And much of that wasted food isn’t sold because it is somewhat irregular, meaning it is deemed too small, too big, too misshapen or bruised to be attractive to customers. But often these irregularities are so minor that they have no impact on the taste or utility of the product. Fortunately, reducing food waste is starting to become an issue of national concern, and more and more vendors are willing to sell — and more and more customers are willing to buy — these irregular products, widely known as “seconds.” I have noticed, just over the past year, that more vendors are displaying seconds, and I have taken advantage to buy excellent items such as peaches, apricots, cherries and apples at handsome discounts. • Thank you for being a friend. If you become a farmers market regular, you’ll almost certainly get to know your favorite vendors. They might even greet you by name, like Norm on “Cheers.” They will freely share advice about how to prepare the items they sell and what’s in stock, coming up, or at the end of their growing seasons. All reason enough to shop there. But… if you get to know producers and buy regularly from their stands, you are more likely to get a personal discount. That is also true if you introduce your friends and family to become customers. It works in bars and restaurants, so why not at farmers markets? The caveat is that you should never expect your favorite farmer to give you a discount. Remember and respect that these are folks who work hard to bring you all that delicious food, and few of them are getting rich doing so. Be grateful for all that they are doing for you. And if they do give you a little price break, please remember to thank them. Very much. • Food with benefits. Improving access to healthy, nutritious food for lower-income Americans is one of the top priorities for those of us in the Good Food movement (which is why this website is called “Good Food on Every Table”). Fortunately, many of the nation’s farmers markets are now accepting Electronic Benefit Transfer (EBT) card payments, and many of those also are participating in “double value” programs that give those customers twice as much purchasing power up to a certain amount. If you are a recipient of food assistance dollars, you are urged to take advantage of this great program. • Good things don’t come to those who wait (usually). One thing you should not do is show up at the end of the market day and expect the farmers to slash their prices to unload unsold product. There is an obvious and good reason for this: If word got out that vendors were doing this sort of thing, many customers might wait until near closing time to try to scoop up bargains. 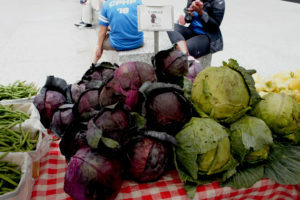 Those cabbages would make a lot of cole slaw or sauerkraut. Photo by Bob Benenson/FamilyFarmed. We found this out the hard way when we started doing this feature in 2014. We crowd-sourced some tips from readers, and one came from a well-meaning woman who said she had, in fact, gotten end-of-day discounts at her local market. But when we published that, we received some rather, um, lively feedback that this practice was an exception to common practice. In fact, some farmers market managers forbid this practice. Don’t worry, though, about those leftover items going to waste. Many vendors have standing arrangements with food assistance providers, and even some restaurants, to take at least some of what they couldn’t sell off their hands. Others might sell remaining products to food hubs that act as intermediaries between smaller-sized farms and wholesale buyers, or to processors who turn local produce into value-added products. This entry was posted in Direct Farm Marketing, Family Farms, Farm businesses, Farmers markets, Food assistance, Food Entrepreneurs, Food waste, Good Food marketing, Local Food, Regional food systems, Small Farmers, Sustainable food retailing and tagged direct food marketing, FamilyFarmed, Farmers Market Savings, farmers markets, Federal Plaza Farmers Market Chicago, Good Food movement, Green Acres Farm Indiana, Green City Market Chicago, Mick Klug Farm, National Farmers Market Coalition, Nichols Farm & Orchard, Saving money at farmers markets, Smits Farm, U.S. Department of Agriculture, USDA. Bookmark the permalink. Another way to receive more value for the organic food you purchase at farmers’ markets is to learn how to use more parts of the food you buy, such as beet tops and carrot tops, which can be added to soups and salads.